The year is 1984. Aomame sits in a taxi on the expressway in Tokyo. Her work is not the kind which can be discussed in public but she is in a hurry to carry out an assignment and, with the traffic at a stand-still, the driver proposes a solution. She agrees, but as a result of her actions starts to feel increasingly detached from the real world. She has been on a top-secret mission, and her next job will lead her to encounter the apparently superhuman founder of a religious cult. Aomame and Tengo's stories influence one another, at times by accident and at times intentionally, as the two come closer and closer to intertwining. 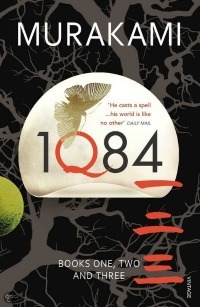 As 1Q84 accelerates towards its conclusion, both are pursued by persons and forces they do not know and cannot understand. As they begin to decipher more about the strange world into which they have slipped, so they sense their destinies converging. What they cannot know is whether they will find one another before they are themselves found. It’s not me but the world that’s deranged. At some point in time, the world I knew either vanished or withdrew, and another world came to take its place. Like the switching of a track. In other words, my mind, here and now, belongs to the world that was, but the world itself has already changed into something else. So far, the actual changes carried out in that process are limited i number. Most of the new world has been retained from the world I knew, which is why the changes have presented (virtually) no impediments to my daily life – so far. But the changes that have already taken place will almost certainly create other, greater, differences around me as time goes by. Those differences will expand little by little and will, in some cases, destroy the logicality of the actions I take. They could well cause me to commit errors that are – for me – literally fatal. Wat hebben Aomame en Tengo met elkaar te maken? Hoe is Aomame in de pararelle wereld terechtgekomen? En nog belangrijker, hoe komt ze weer terug in haar eigen wereld? Wordt Tengo een echte schrijver? Bestaan de Little People echt of is het een verzinsel? Dit verhaal bestaat uit twee verhaallijnen: het verhaal van Aomame en het verhaal van Tengo. Ze maken allebei vreemde dingen mee, maar daar laten zij zich niet door van de wijs brengen. Murakami krijgt het voor elkaar om de lezer (mij dus) bijna 1000 bladzijden lang gefascineerd te krijgen voor dit verhaal. Ik wilde heel graag weten wat Aomame en Tengo uiteindelijk met elkaar te maken zou hebben, en hoe het verhaal zou aflopen. De vele surrealistische en bizarre elementen maken dit verhaal voor mij het lezen zeker waard. Ik wil meer boeken van Murakami lezen!